Unless you’ve been living on another planet, it’s been hard to miss the buzz around CBD oil in the health and wellness world. But CBD’s benefits don’t end there, and right now beauty bibles like Vogue and Cosmo are celebrating CBD as the on-trend skincare super-ingredient. So what’s all the fuss about CBD oil and why should you add it to your skin care routine? What is CBD And Why Is It Good For My Skin? CBD, otherwise known as cannabidiol, is a naturally occurring molecule in hemp known as a cannabinoid. While CBD has hit the headlines for helping symptoms related to epilepsy, anxiety, chronic pain and sleep disorders, it’s CBD’s anti-inflammatory and antioxidant properties that have got global skin care manufacturers launching their own CBD beauty ranges. Why is it a good idea to have beauty products and skincare ranges that are anti-inflammatory and antioxidant? Irritated, blotchy skin is a problem that affects us all. It might be as a result of seasonal skin dryness, putting too many toxins into our body, an allergic reaction to a beauty product or detergent, or perhaps a skin condition like dermatitis or psoriasis. Either way, there is some kind of inflammation going on, which is part of the body’s immune response. Inflammation isn’t necessarily bad, but when we’re walking round like with a face like an angry tomato, CBD’s inflammation-reducing effect certainly comes in handy. Indeed, for skin conditions like eczema and psoriasis, CBD is currently being studied as a therapeutic solution to itching and redness. And what’s the big deal about CBD being an antioxidant? Antioxidants are substances, often found in fruit and vegetables, that slow down the damage caused to cells by environmental pollution, toxins, and stress. Vitamin C and E are both antioxidants, but did you know that CBD is considered just as powerful. Check out the ingredients in your favourite beauty product, and you will almost certainly find at least one antioxidant purporting to protect us against the process of ageing. 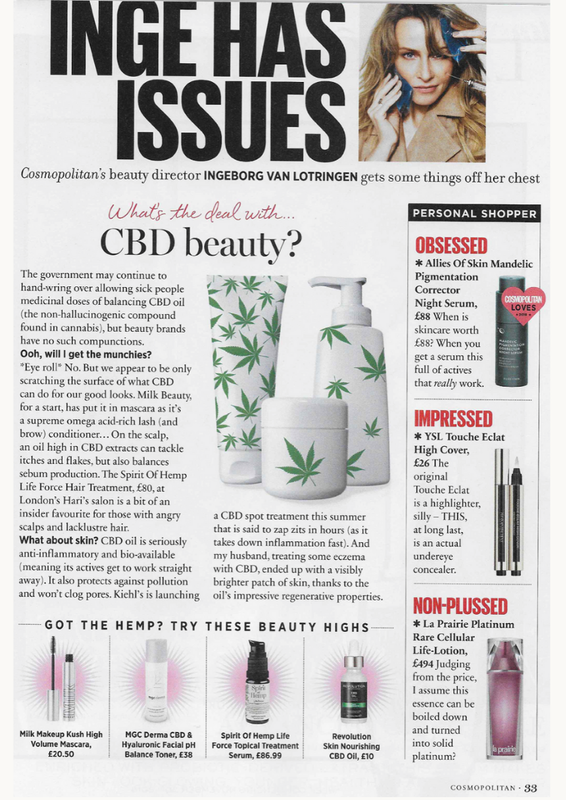 Little wonder that CBD is the beauty wonder-ingredient of the moment. CBD has also been found to regulate the production of sebum in our skin, with studies showing that CBD application may help to improve skin conditions like acne. What is CBD Oil Skin Care? Most CBD oils mixed with a carrier oil can also be used topically on skin. But in the 21st Century, we love our beauty products to not only work miracles on our skin, but to smell like we’ve just stepped out of a meadow of wild flowers. So when it comes to the current crop of CBD products, most are mixed with additional non-hemp ingredients, such as luxuriant oils such as argan or coconut, and aromatherapy essential oils. Our Spirit of Hemp Life Force Serum contains 100% organic whole plant CBD oil, healing tamanu nut oil, plus essential oils such as frankincense, lavender, peppermint, oregano, and wild thyme. The result is an intensely soothing hemp skin care oil, that gives just the right amount of TLC to itchy and dry skin. 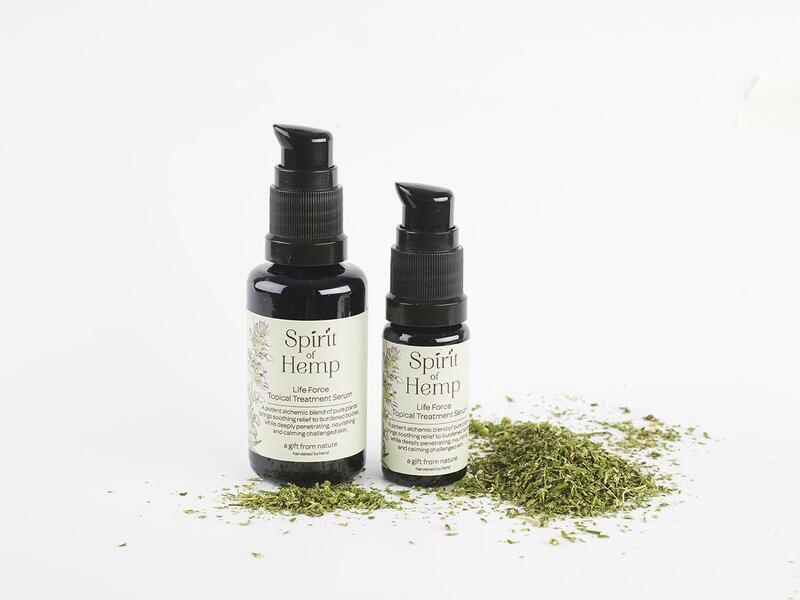 We’re a tad biased, but it’s fair to say at Spirit of Hemp we’re massive fans of our Life Force Serum. But don’t just take our word for it. Our customers have been particularly vocal about singing its praises. "The government may continue to hand-wring over sick people medicinal doses of balancing CBD oil (the non-hallucinogenic compound found in cannabis), but beauty brands have no such compunctions. “On the scalp, an oil high in CBD extracts can tackles itches and flakes, but also balances sebum production. The Spirit of Hemp Life Force Hair Treatment, £80, at London's Hari's salon is a bit of an insider favourite for those with angry scalps and lacklustre hair." 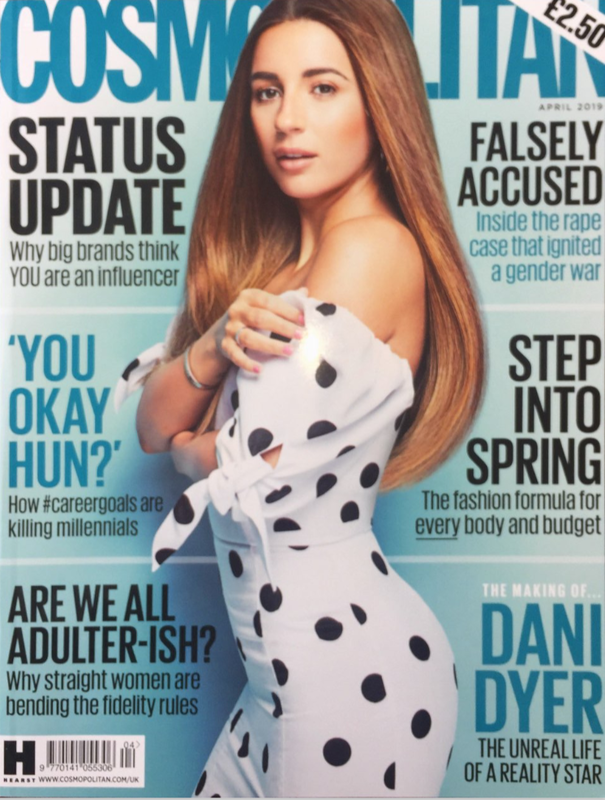 While 2019 is the year CBD looks set to take centre stage in the beauty industry as the buzz-ingredient of the moment, we think it’s fair to say we got there first. If you’re interested in trying a CBD or hemp skin care product, our 100% organic CBD skin treatment, Life Force Serum is a great place to start. Just stop by our online shop for more information.